Whether on the field or at Harvard, Joe McCormick wasn’t about to let his sudden loss of vision keep him from competing. JOE MCCORMICK, WHO GRADUATES FROM HARVARD with a degree in computer science on May 29, knows to the decimal place how much he weighs: 196.2 pounds. Four years ago, as a senior at Malden Catholic, he weighed 180.0. That’s back when he bought his tuxedo to go to the prom with his girlfriend, Ashley Borders. And that’s the night — at the prom — that Joe realized he was starting to lose vision in his left eye, having already lost it in his right. Ashley wore wild-strawberry pink, Joe remembers. His pocket square matched her color, and they were the only two out on the floor for the last dance. Aerosmith: I could stay awake just to hear you . . .
“Joe wouldn’t let us leave,” Ashley says. And so they stayed. He looked even more like Tom Brady than usual that night in April 2010, at least to her. It was something in the jaw. He danced like crazy, too, even though he wasn’t supposed to exert himself. It had only been a few months since he’d found out about his Leber’s hereditary optic neuropathy (LHON), a degenerative condition that affects only an estimated 35,000 people worldwide and usually comes on during early adulthood. But prom night was a good night. Not like the night Ashley had broken down when Joe called to tell her about his diagnosis. This was better. They could do this. He could still see her. Today, 21-year-old Joe figures he could still squeeze into that tux. Might just wear it under his graduation gown, he likes it so much. And Ashley, now as then, will be there to admire. After he’s heard his name called, Joe will take a little time off before starting his job at Leaf, a Cambridge-based software company where he’s interned for two years. “I’d say in terms of the average person, I’m a computer whiz,” he says. “A geek if you will.” He uses a screen magnifier called MAGic that multiplies by 15 times the size of the code he’s studying. Another program, JAWS, reads out loud what’s on his screen. Joe, whose condition has left him with 20/800 vision, follows the Red Sox with the same kind of precision and drive he brings to his work and studies. He recalls seeing the 2004 one-hopper in St. Louis from his parents’ bed in Melrose, and now he analyzes everything about the team with the help of JAWS and Joe Castiglione. He knows that Shane Victorino’s double to left increased their chances of winning last year’s series clincher to 83.4 percent, and he even calculates the tweet-rate of Dustin Pedroia (.375 per day). Joe’s favorite player is Pawtucket pitcher Brandon Workman (1.12 tweets per day), which is fitting for a man of Joe’s work ethic. When he found out in 2010 that he was going to lose most of his vision within weeks, Joe rushed to prepare for his AP tests. He had to take them early so he could still see them. Many strings were pulled to make that happen, and his mom, Dawn, cried when he got his 5 on calc. Some problems, though, were going to be harder for Joe to solve. 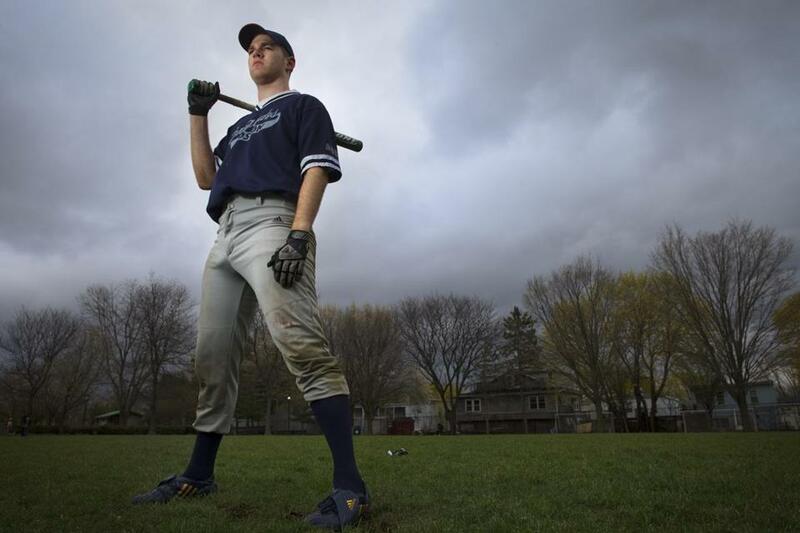 As his vision deteriorated the summer before college, this former varsity soccer goalie and baseball diehard feared that he’d never play sports again, never make a sprawling stop or hit another rec-league single. He hadn’t realized how much he would miss making contact. But even with that loss, Joe kept in shape like he always had. He went to school and set himself the task of memorizing the Harvard campus. And he developed a grammatically suspect mantra that sums up his perseverance: “The Workman do work,” he says. And so, a year removed from his sudden vision loss, Joe McCormick was ready when he realized he would need to put in even more effort to ace his next, very different test. WHEN JOE MET Joey “Wrong Way” Buizon in 2011, he couldn’t have expected the direction he was about to head in. Buizon, Joe’s contact at the Massachusetts Commission for the Blind, became something of a mentor to him, sharing tips on how to land an internship now that his circumstances had changed. But he also told him about the Association of Blind Citizens’ Boston Renegades, and that conversation led Joe to a different kind of position. 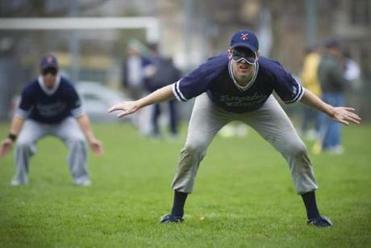 Joe, wearing the blindfold that levels the Beep Baseball playing field, drills in Watertown. 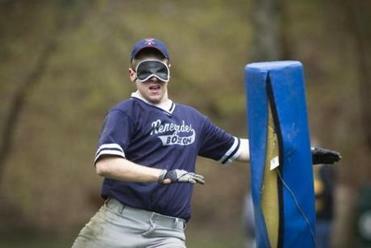 The Renegades play a sport called Beep Baseball, an adapted national pastime for the blind and visually impaired, and Buizon was one of their offensive stars. Joe listened politely but pushed the game out of his mind for a while. 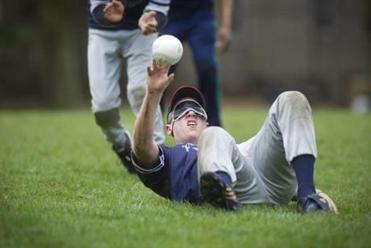 Newly blind men and baseball don’t usually mix. But when he found out that another player on the Renegades also had LHON, Joe gave it a try. He studied the game and put on the blindfold that everyone, regardless of degree of sightedness, wears to level the field. In Beep Baseball, the pitcher and batter are on the same team, and the batter swings based on carefully practiced timing. After contact, six fielders on the other team attempt to smother the beeping baseball, and if they grab it before the batter reaches a 4-foot-tall buzzing base 100 feet from the plate, they record the putout. If not, the batter scores. One catch: Either first or third base can buzz, depending on the umpire’s whim. That’s the reason for Buizon’s nickname, “Wrong Way.” He’d run to first when third was buzzing. When Joe started playing, he was similarly disoriented, thrown off by the strange way the ball bounced and spun in the field and its shrill beep. But he worked on his game hard, “damn hard,” he says, and now he can anticipate when the ball is coming to him at his position at first base, assessing both its trajectory and speed. Joe’s Renegades pride themselves on being the most well prepared, most analytical, most spirited team in the league. When they’re not creating nicknames for each other — Joe Mac’s is “Way Back” — they’re joking about the fact that they’re the team in the National Beep Baseball Association with the most advanced degrees: three PhDs on the coaching staff, a pile of MAs in the field, and an Ivy League convention on the bench. As a rookie, Joe didn’t have much experience swinging blind, but Weissman took and then analyzed copious video before giving him his notes, and Joe improved quickly. Now he’s working on the arc of his swing, trying to hit more fly balls. They say that only five have been caught in Beep Baseball’s 40-year history, so hitting the ball in the air pretty much guarantees a runner enough time to score. Joe’s intensity and Weissman’s personality — the coach talks like Bradley Whitford on The West Wing after a triple espresso — have helped make the Renegades what they are. They can compete with anyone, but they can also be tense to a fault. During last year’s World Series, a gathering of 20 teams from the United States and Taiwan, the Renegades had an elimination game against the X-Treme, a team representing the Rehab Hospital of Indiana. Joe got worked up, made some quick outs at the plate, overran a ball in the field. The ’Gades fell behind 10-2 in the first two innings. It was 90 degrees, and the beep ball’s battery suffers in the humidity, so the sound was hard to locate. There was a delay for a passing 18-wheeler, which threw off the players. Then a delay for an ambulance. Then Aqil Sajjad, a Pakistani immigrant and PhD student in high energy theory physics at Harvard, had to endure some casual racism from the other bench. “Don’t shoot ’im,” I heard an Indiana player say when Sajjad was called to the plate. Larry Haile, Boston’s power-hitting left fielder and accessibility coordinator for the MBTA, didn’t want to let it pass. “Let’s score for that one,” he muttered. They started clawing back one run at a time as their defense shut down the X-Treme for the last four innings. Sajjad scored, and so did Joe Quintanilla, a former marathoner who works at the National Braille Press. Guy Zuccarello, a league all-star, made five putouts. In the sixth and final inning, the Renegades tallied three runs to make it 10-7, with Joe coming to the plate. He was Boston’s last chance. Joe customarily hits over .500 at tournaments, but he’d been struggling. He talked a bit with his pitcher, Ron Cochran (master of education). They worked a full count, with Joe letting one pitch pass so he could hear better where it was coming in. Down to his last cut, he crushed one to left and sprinted toward first. In Beep Baseball, batters run to a buzzing base to score. He reached base after his shot, but something was wrong. A Beep Baseball tournament usually sounds like a parade of British police cars, but things were quiet. “I knew once I’d hit it that there was a very good chance I’d knocked the beep out of the ball,” Joe says. He’d broken the ball. His run was nullified. By rule, Joe had a new count. He worked it full again, and then Cochran said, “Ready, pitch.” When Joe heard the “ch” in pitch, he took his cut. That’s his precise cue, the “ch.” The timing seemed perfect, but Joe swung through it anyway, striking out for only the fourth time in his 29 World Series at-bats. The Renegades were eliminated. Joe cursed and spiked his batting gloves. That’s the only time he let himself get down, those few seconds. He blew up, but then he moved on. Same was true the night he found out that his blindness wasn’t going to fade. Found out that he probably wouldn’t be able to clearly see the child he’s planning on having in a few years (Joe’s a five-year plan kind of guy). AFTER THE FIELD CLEARED and the X-Treme gave their little “2-4-6-8” cheer, Rob Weissman came back to the bench. He said that dumb cheer was the Renegades’ consolation prize for messing up the first two innings, although he used more colorful language. During the profane post-mortem, a ball kept up its beeping. Back in Joe’s senior year of high school, he wondered if he’d get that same ribbing from his friends. They didn’t always know what to do; the blindness came on so quickly. One day he was building prototypes for Malden Catholic’s robotics team and taking goal kicks, and the next he was facing his very last chance to drive a car — a Dodge Caravan at the Square One Mall. “I just remember early on with the Leber’s asking Joe if we were going to joke about it,” says his friend Sean Sweeney. They’d always mocked each other lightly, but it felt different now. Mean, maybe. It was Joe who finally gave them permission to fire away, and that’s what they did, teasing him for making his terrible puns and bumping into things a little too casually. One evening not long ago, their ease with one another regained and the van safely in the garage, Joe and his friends went out to play Beep Ball. He wanted to show them what he’d been up to. They occupied the field beside Incarnation Catholic church in Melrose, where Joe had played center field in a youth league. Joe’s blindfolded buddies dove around for the ball pretty well, but he had the edge. Then the police showed up and shined a spotlight on them. They explained themselves to the officer, without playing the blind card, and the game continued, way past dark. Timidity has never been Joe’s problem. When he was accepted to Harvard, the school offered him a year off, a lighter schedule. No, he said. He would finish on time. He bought a 4-by-8-foot white board and got going on his differential equations. He’d scrawl huge numbers on the board, take pictures of the work, and hand in the printouts to his professors. When I visited Joe at his parents’ home last winter, he reminisced about those early college days and about his transition from sight to near-sightlessness. He sat a foot away from a 50-inch TV as the Patriots played the Ravens. He saw plenty of bright green and some blurry Brady, and we ate Joe McCormick Sr.’s famous calzones, which help explain why Joe Jr. has ballooned up to 196.2 pounds. 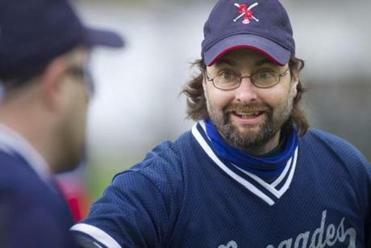 The Renegades’ sighted coach, Rob Weissman, at practice in April. Joe remembered his MC graduation. As one of the top students in his class, he had to declaim the biographical citations of his classmates. He wore thick glasses, but they didn’t help. His vision had faded too much. No matter, his friend Sean recalled. Joe, in his fashion, had memorized the 20 or so citations, and he recited them without a hitch. In August, Joe’s going to use up all his vacation days from his new job at Leaf to get to the Beep Baseball World Series in Minnesota. He’s got the highest batting average in Renegade history, after all, and they need him if they’re going to make a run at the title. Compared with the work he’s done since 2010, Joe figures the job of getting himself back in playing shape — 190.0 pounds — should be a breeze. David Wanczyk, a nonfiction teaching fellow at Ohio University, is writing a book about Beep Baseball. Send comments to magazine @globe.com.